Who says vegetables don't relieve stress? Dimensions: 3 1/4" x 2 1/4" x 2 1/4"
These logo Eggplant Stress Balls are pretty in purple. Purple is a color of royalty, so shouldn't your customers get the royal treatment and a few imprinted Eggplant Stress Balls during your promotions? It isn't technically an egg, but this eggplant is the perfect addition to any cooking or food promotion. Its large imprint allows ample room for a company logo, a tag line, a phone number, and a URL. Your customers will love these advertising Eggplant Stress Balls, and you'll love the juicy sales they'll bring! Stress balls are made of foam, so please don't try to eat these custom Eggplant Stress Balls. However, you can still have squeezing the heck out of them, throwing them at fellow coworkers, or sitting on them and waiting for them to hatch. 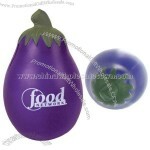 This Custom Imprinted Eggplant Stress Reliever is the perfect tradeshow giveaway.